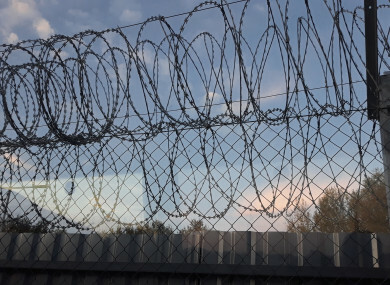 EU leaders must end the practice of imprisoning unaccompanied minors in Hungary and throughout Europe, writes Sinn Fein senator Paul Gavan. I SHOULD HAVE known the day would not end well when a Hungarian parliamentarian started cracking a joke about “the final solution” at our first meeting of the day. Or even before that as we made our way to the Parliamentary Building in Budapest when one of our hosts mocked a monument to those killed fighting fascism in World War II. But even so, I was shocked to my very core when I met three teenagers imprisoned in a 30 x 40 meter cage in the Roszke Transit Zone. I was part of a 10-person delegation from the Parliamentary Assembly of the Council of Europe (PACE) visiting the immigration detention centre at Roszke along the Hungarian Serbian Border. We were visiting as part of the PACE Campaign to end the detention of migrant children. The day began with a series of meetings with government politicians who were not shy about telling us where they stood when it came to the issue of immigration. First up was Mr Zsolt Nemeth, chairperson of the Foreign Affairs Committee who proudly boasted that his government has replaced a priority on human rights with a priority on security. Post-colonial immigration is a special problem for the west, it’s their problem, not ours,” he said. “We have a problem with a Roma underclass which needs to be integrated – that is our problem. He went on to explain that his party, Fidesz, is opposed to Hungary “becoming an immigrant society and that is why we need a fence”. “We have proved that immigration is not inevitable,” he added. If someone climbs over our fence, we let the dog deal with that. So maybe I should not have been shocked when two hours later – just before the Serbian border – we saw a series of blue industrial containers lined up one behind the other in a cordoned-off area. Behind a display of barbed wire that Donald Trump would be proud of was the so-called ‘transit zone’ operated by the Hungarian government. We met three of the 75 inmates currently imprisoned in one of Hungary’s ‘processing centres’ for asylum applicants. The three teenagers were originally from Afghanistan and had travelled to the Hungarian border as unaccompanied minors fleeing the Taliban. I could only imagine the struggles they had to endure on their journey, including a 12-month wait at the Serbian border. The boys, aged between 14 and 16, were anxious to let the PACE delegation know what was happening to them. They explained how they were permanently cordoned in within their 30×40-metre living space, on a 24/7 basis. Seeing how small the living space was and realising how restrictive their lives were – that they were permanently confined in this cage of barbed wire – was shocking. This is jail camp, they treat us worse than animals,” said one of the youngsters. He had only been there a few weeks. His companion, who had been there for over six months broke down before us, crying tears of rage and despair. I thought about my own two sons who were the same age and how I would feel if they had been imprisoned like this. I asked them how they spent the time each day in their small living space. “We eat, sleep, go to the toilet, that is it,” was the reply. They were treated worse than criminal prisoners would be in Ireland. There were no recreation facilities provided. I spoke to a UNHCR representative who told me first hand of the damage this incarceration is doing to the children in terms of mental stress, anxiety and depression. Some children, including one that we met, have tried to self-harm during their incarceration. When I spoke to a government representative about the disgraceful conditions meted out to these children, he started disputing how old the teenager was rather than acknowledge the horror of what is going on in the detention centre. Our delegation didn’t get to meet with other inmates in the transit zone, but we could see families with small children living in equally restricted living space, as we made our way to leave. Children as young as 4 years of age hemmed in day in, day out. EU leaders must take action to end the shame of immigration detention of unaccompanied minors in Hungary and throughout member states. France and Belgium are others engaged in the barbaric practice of imprisoning unaccompanied minors. Here at home, we still have our own shame through the continued practice of so-called direct provision. Throughout Europe we are witnessing a roll back of the values of tolerance, freedom and liberty, replaced by values of racism, prejudice and authoritarianism. This is fortress Europe where children are locked in cages. Email “Opinion: Children in cages is the new normal in Hungary”. Feedback on “Opinion: Children in cages is the new normal in Hungary”.